President Barack Obama wields a fake "Star Wars"-style lightsaber with young children visiting the White House for an event held by the Office on Olympic, Paralympic and Youth Sport. The event drew hundreds of young athletes, as well as the delegation to the International Olympic Committee, working with first lady Michelle Obama to promote Chicago’s bid for the 2016 Summer Olympics, and "highlight the Obama administration’s commitment to service, healthy living and youth sport." 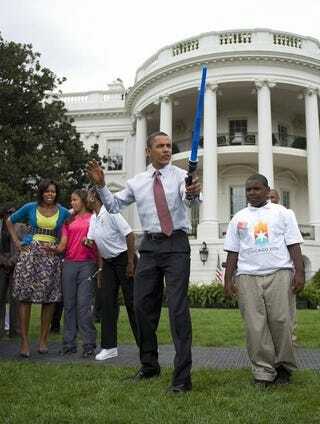 Obama looks right at home with the lightsaber. Captions, anyone? Covers the White House and Washington for The Root. Follow her on Twitter.